Fillet and skin the turbot. Make a stock with the chopped up turbot bones and head. Rinse them in cold water. Slice the onions and the leeks. Sweat with the butter, add the bones and cover with cold water. Add the bouquet garni, bring to the boil and skim. Simmer for twenty minutes (do not add salt). Leave to rest when it has finished cooking to obtain a clear stock. Gently pass through a fine cone sieve without pressing and reduce to a slightly syrupy consistency (to the stage before it becomes a glaze). Season. Carefully season the fillets with salt and pepper. Melt the butter and the groundnut oil in a non-stick pan. 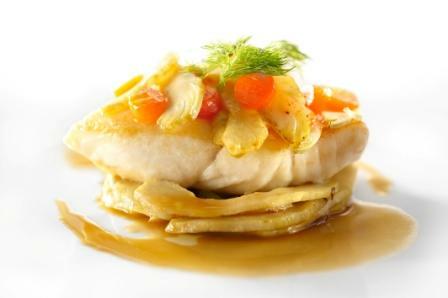 When the butter begins to foam, add the turbot and cook to a light golden colour to accentuate the flavour of the fish. Cook gently and evenly, with the butter constantly sizzling. The fish is cooked when the internal temperature is 54 °C. Turn the artichokes. Place in some water and lemon juice. Slice thinly on a mandolin. Fry the slices in olive oil, keeping them slightly crunchy, season. Set the artichoke slices to one side. Thinly slice the white onions and the green peppers. Cut the red peppers into diamond shapes. Sweat together in olive oil. Make a small circle four centimetres in diameter in the centre of the plate with the stewed onions and green peppers. Surround with a circle of the artichoke slices (keep four nice slices to decorate the fillet). Place the fish in the centre. Put the saved artichoke slices on top, interspersed with sprigs of fennel and the red pepper diamonds. Finish with two curling strokes of the reduced jus on the plate on either side of the fish.